Used by the Empire's Invincible Lord. 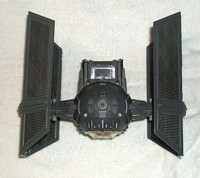 The DARTH VADER'S TIE FIGHTER is painted an evil gray. The distinctively curved Solar Panels "pop off" at the push of a button to simulate "Battle Damage". A remote lever raises the cockpit seat through the top hatch. 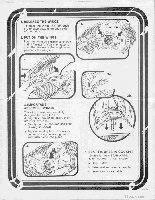 Cockpit can hold any of the original 12 Action Figures. For added play excitement, a dramatic red laser canon lights up and emits a "whining " laser sound when the rear deck button is pressed. 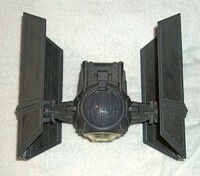 Darth Vader's TIE was the first of three ships that Kenner based on the original TIE Fighter. 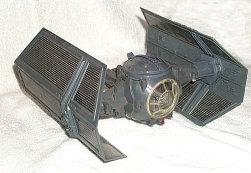 Although the different models each have a distinctive appearance, the center section is identical for all ships of the series (Original, Darth Vader's, Battle Damaged, Interceptor). Additionally, the wing extensions are the same molding for all but the TIE Interceptor. 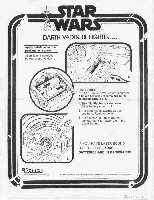 Darth Vader's TIE was not offered as an ESB release but did make a return in 1983 in special "Star Wars Collector Series" packaging. Kenner brought back the Landspeeder, Darth Vader's TIE, and Dewback in essentially the same Star Wars boxes that they had originally appeared. The only difference was the addition of a "Collector Series" logo to the box.